TODAY: The Rangers have officially announced the signing. TUESDAY: The Rangers have agreed to a one-year deal with veteran infielder Asdrubal Cabrera, pending a physical, according to Ken Rosenthal of The Athletic (Twitter link). The deal promises the Octagon client $3.5MM, per ESPN.com’s Jeff Passan (via Twitter). Initial indications are that Cabrera will primarily line up at third base in Texas. With the team’s middle-infield duo already settled, that certainly makes sense. No doubt, the chance for regular duty was a large part of the draw for the long-time big leaguer. Cabrera, 33, has spent most of his career in the middle infield, with the lion’s share of that time coming at shortstop. He has lined up at third in recent seasons, but still only has accumulated 471 2/3 frames at the hot corner — representing less than four percent of his total action in the field at the game’s highest level. While Cabrera has at times actually drawn improved grades on his glove at short in recent years, particularly in the eyes of UZR, his range has long represented a major demerit. Since he’s otherwise a surehanded fielder, and clearly has the arm to work on the left side of the infield, suggests that third base represents a sensible position. Of course, the calling card for Cabrera remains his bat. He has actually turned things up over the past three years, posting a cumulative .274/.334/.456 slash in that span that’s reflective of his best earlier-career campaigns. The switch-hitter hits for a high average, delivers a fair bit of pop (23 home runs in 2018), and has long succeeded against both right- and left-handed pitching (career .752 OPS vs. .759 OPS, respectively). In many regards, this seems to be a bit of a bargain rate for a solid veteran who has delivered so much offense in recent seasons. Though he fell just off of MLBTR’s list of the top fifty free agents, receiving honorable mention consideration, Cabrera is younger than Jed Lowrie (who signed for two years and $20MM) and easily outperformed Brian Dozier (one year, $9MM) at the plate last year. Trouble was, this year’s market (including free agents and trade candidates) was loaded with players who could handle second and/or third base. Among them, Marwin Gonzalez, Mike Moustakas, Josh Harrison, Derek Dietrich, Neil Walker, Logan Forsythe, and others remain available on the open market (in addition, of course, to superstar Manny Machado). As it turns out, Cabrera will land just shy of Ian Kinsler in total guarantee, though he’ll avoid handing over control of another season via club option. With the move, the Rangers will fill the void created when they traded Jurickson Profar earlier in the offseason. Elvis Andrus and Rougned Odor will remain entrenched at shortstop and second base, respectively, though it surely doesn’t hurt that Cabrera could step in at either position if a need arises. Slugger Joey Gallo will presumably range the outfield, though he’s also an option at third base if there’s a need. In conjunction with some other veteran additions — veteran backstop Jeff Mathis, three starters (Lance Lynn, Drew Smyly, Shelby Miller), and reliever Jesse Chavez — the Rangers have certainly shored up their roster. Among those acquisitions, only Mathis and Lynn required multiple years, and none of the salaries represents a major outlay for an organization that has a history of significant payrolls and is readying for a new stadium boost. All in all, there’s greater upside on hand than you might have expected, particularly if a few key young players can make strides. Still, it’s tough to see this group making a strong run in a top-heavy American League. Maintaining a reasonably competitive product won’t allow the Rangers to pocket cost-savings and draft picks to the extent they might have otherwise, but it should help boost revenue and fan interest in the near-term. It’ll be interesting to see how the roster reloading effort shakes out in Texas. The Phillies have officially agreed to acquire infielder Asdrubal Cabrera from the Mets, as first reported by Andy Martino of SNY.tv (Twitter link). Righty Franklyn Kilome is heading to New York in return, as Ken Rosenthal of The Athletic first reported (via Twitter). It’ll certainly be interesting to see how the Phils decide to utilize Cabrera. The veteran has mostly played second base this year, grading quite poorly in the field, but that’s not likely where he’ll play in Philadelphia. It seems possible that Cabrera will slot in mostly at third base and shortstop. He played the latter position for much of his career and split his time between all three of those infield spots in 2017. Having tried and failed to land Manny Machado, the Phillies seem to have settled on a strategy of mixing and matching on the left side of the infield. To this point, they have primarily utilized Maikel Franco and Scott Kingery, but the rehabbing J.P. Crawford will also ultimately factor in again as well. The current roster also includes infield reserves Jesmuel Valentin and Trevor Plouffe, though it wouldn’t be surprising to see one of those players moved off the active roster to make way for Cabrera. Regardless of what patch of dirt Cabrera occupies, it is clear that the Phils will gladly put his bat in the lineup. Though Franco has turned it on of late, Kingery and Crawford have produced little offensively. As for Cabrera, he has been a solid offensive performer throughout his dozen seasons in the majors. But he has never been better than in New York. Since inking a two-year deal with an option (picked up last winter), Cabrera carries a .279/.339/.464 slash with 55 home runs. The switch-hitting Cabrera destroyed opposing righties in 2018, posting a .285/.345/.535 slash. He hasn’t been as productive when facing southpaws this year, but had greater success against them in the prior campaign. For his career, Cabrera has very neutral splits, so there’s good reason to think he can succeed regardless of which side of the box he’s in. For the Mets, there was no reason not to cash in the last two months of control over Cabrera, who’s earning a manageable $8.25MM salary this year. The New York organization is well out of the postseason hunt and had already begun moving expiring contracts for the second-straight summer. Thus far in 2018, the 23-year-old owns a 4.24 ERA with 7.3 K/9 and 4.5 BB/9 over 102 Double-A innings. Perhaps he’s not far from being ready for an opportunity in a major-league pen, but it seems doubtful he’ll receive a shot in the rotation until he has completed some further development. Kilome is already on the 40-man roster, which will increase the pressures to make him of use at the MLB level. 12:03pm: Ken Rosenthal of The Athletic tweets that the Mets and Brewers have discussed a package deal that would send both players to Milwaukee, though there’s no indication that anything is close to being completed. The D-backs are indeed in the mix for Cabrera, he adds. 9:05am: Teams who’ve spoken to the Mets about the availability of Asdrubal Cabrera have gotten the impression that he’ll be traded soon, reports Andy Martino of SNY.tv. While “soon” is a relative term, especially with the non-waiver trade deadline just four days away, Martino adds that the Mets then plan to shift their “full attention” to finding a trade partner for Zack Wheeler. Presumably, they’ll want to leave themselves ample room to discuss that swap, so it stands to reason that they’d hope to wrap up a Cabrera swap in short order. ESPN’s Buster Olney tweeted yesterday that the Diamondbacks have “checked in” on Cabrera as they seek to bolster their own infield mix. Joel Sherman of the New York Post adds the Indians and the Phillies to the fray, though he notes that Philadelphia’s interest would be stronger were Cabrera still viewed as a capable shortstop. Fancred’s Jon Heyman tweets that the Braves and Brewers, too, may be in the market. While a number of teams have inquired to some extent, the Post’s Mike Puma surmised yesterday that there are three or four teams with legitimate interest in Cabrera (Twitter link). As for Wheeler, he’s generating interest from the Brewers and Reds, per Martino. The Cubs had shown interest, though yesterday’s agreement to acquire Cole Hamels would quite likely put an end to that pursuit. While the Mets have had just about everything possible go wrong for them over the past couple of seasons, their signing of Cabrera in the 2015-16 offseason has proven to be an excellent one. He’s earning $8.5MM in the third year of what proved to be a $25MM contract (after his 2018 option was exercised) and is hitting .277/.329/.488 with 18 homers, 23 doubles and a triple. Cabrera, though, has received dreadful defensive ratings for his work at second base (-18 Defensive Runs Saved, -6 Ultimate Zone Rating), which won’t do his trade value any favors. As for Wheeler, he’ll obviously have the greater value of the pair, given his affordable salary, the fact that he’s controlled through 2019, his recent success and the plethora of teams seeking to bolster their rotation in the coming days. Over his past 10 starts, Wheeler has worked to a 3.50 ERA (3.40 FIP, 4.17 xFIP) with 7.8 K/9, 3.1 BB/9 and 0.56 HR/9 with a 40.2 percent ground-ball rate. His fastball has averaged 96.4 mph in that span, and he’s posted a strong 11.3 percent swinging-strike rate. Puma noted yesterday that as many as 10 teams have displayed some level of interest. Mets pending free-agent infielder Asdrubal Cabrera is enjoying one of his best seasons, and contending teams have taken notice. The Indians, Brewers and Phillies are among the clubs with interest in Cabrera, Buster Olney of ESPN tweets. The switch-hitting Cabrera has already been a member of the Indians, with whom he played from 2007-14. Cabrera was primarily a shortstop during that span, but the Indians certainly don’t need help there with Francisco Lindor in the fold. Second base is another story, though, as Jason Kipnis is enduring his second straight subpar offensive season. The 32-year-old Cabrera has shifted to the keystone on a full-time basis and would seemingly be a significant offensive upgrade over Kipnis, having slashed .280/.332/.487 with 17 home runs in 388 plate appearances this season. At the same time, Cabrera has been a disaster in the field, as he has accounted for minus-17 Defensive Runs Saved and a minus-6.0 Ultimate Zone Rating this season. Despite Cabrera’s defensive woes, the Brewers would welcome his presence at the plate. Their second basemen own the majors’ second-worst wRC+ (66), after all, with the Jonathan Villar-led group has having combined for a .227/.285/.340 line in 702 PAs. The Phillies, with on-base machine Cesar Hernandez at second, are in fine shape at the position. 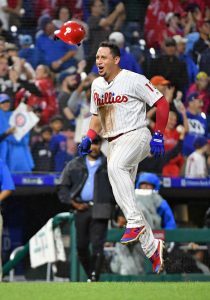 But they need help along the left side of their infield, where they’ve received underwhelming production from Maikel Franco, J.P. Crawford and Scott Kingery, among others. Cabrera has been dreadful at short in recent seasons, however, meaning he’d likely overtake Franco as Philly’s starting third baseman if acquired. One potential problem: Cabrera has made it known he’d prefer to play second. High-priced outfielder Yoenis Cespedes homered in his return from a lengthy DL stint, but dropped a seeming bombshell after the game. Cespedes said that the root cause of his various leg ailments is in fact calcification in his heels, as Tim Britton of The Athletic and MLB.com’s Anthony DiComo (Twitter links) were among those to report. The veteran says the only way to address the problem is a surgical procedure followed by an eight-to-ten month rehab, though it’s not certain that he’ll end up pursuing that course. For now, Cespedes could only say he’s not sure if he’ll be able to play through the rest of the season but hopes to be able to do so. Of course, the current campaign isn’t really the chief concern of the team. With Cespedes promised a total of $58.5MM over the next two seasons, his ability to play out the back half of the deal at a high level — whether in New York or elsewhere — is of much greater importance. At this point, it’s entirely unclear how that situation will shake out. Infielder Asdrubal Cabrera figures to be a fairly notable trade piece for the Mets. The veteran switch-hitter is drawing wide interest, MLB.com’s Mark Feinsand reports on Twitter. While that market is not fully developed, it seems all but certain a deal of some kind will come together by the time the trade deadline arrives. Feinsand cites the Brewers and Diamondbacks as teams “believed to be among [the] potential suitors.” Cabrera placed fifth on our recent ranking of the top 75 trade deadline candidates, though some other infield possibilities could rise in the ranks if their teams move clearly into the selling camp. Cespedes’s situation did not represent the only poor injury news. Infielder T.J. Rivera, who is working back from Tommy John surgery, has been diagnosed with a right elbow sprain, as Tim Healey of Newsday tweets. For now, Rivera will finish a ten-day rest period after receiving a platelet-rich plasma injection, with the ensuing steps presumably still to be determined. The 29-year-old was hoping to reestablish himself as a solid infield piece, but struggled at the plate in six rehab games before this issue arose. Alarm bells rang this evening as Mets righty Noah Syndergaard exhibited a velocity drop (as documented on Twitter by Britton). Fortunately, both the hurler and his manager say there’s no real cause for concern. (See this tweet from MLB.com’s Joe Trezza and this one from DiComo.) Neither his recently problematic finger nor some other issue was to blame for the velo fade. Instead, the team’s viewpoint is that Syndergaard simply experienced fatigue. Blue Jays executive and former Red Sox GM Ben Cherington is emerging as an early potential front office target for the Mets, per ESPN.com’s Buster Olney (via Twitter). Of course, that process is only in the preliminary stages at this point. It’s still not entirely clear just how the Mets will go about addressing the front office uncertainty that arose when GM Sandy Alderson took a leave of absence, leaving a trio of execs to handle things in his absence. Whether or not Alderson ultimately returns in some capacity, though, it seems the club will at least consider bringing in some new voices.